Vegetables – yuck! Even young chefs aren’t always enthusiastic about eating their greens. So here’s a plan to get your Cookery Group fired-up about carrots cabbage, broccoli... and even sprouts! 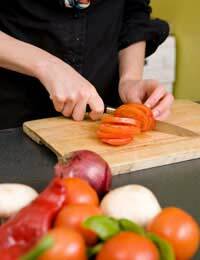 This vegetables session includes basic knife skills, which are suitable for older groups only. If you have any younger members, you can involve them by asking them to make dips, knead pizza dough, or stir tomato sauce. But make sure, if your group is split, that you keep the knife-wielding children under close supervision, while giving the younger children space to watch or knead. You’ll need a good range of equipment to try out these recipes; if you have limited space or equipment, you could cover one recipe per session. Instead of cooking all of the recipes at once, combine one or two with some vegetable-related quizzes or games. Use a sharp knife – a dull blade is harder to use and more likely to cause accidents. Use the right knife – there are visual and functional differences between a bread knife, fruit knife, and vegetable knife. Always cut away from your body – turning the food, rather than yourself. From picking up the knife to putting it down again, keep your eyes on the blade – look away and you’re seconds from a chopped finger, or worse! Hold your knife properly – and if it slips off the worktop, stand back – don’t try to catch it. Carry your knife properly, too – with the blade facing the ground. To chop vegetables, you can either keep your wrist close to the board, lifting and chopping with the blade (the part closest to your hand comes into contact with the veg first); or, you can put the point of the blade on the board, slide the vegetable beneath it, and drop the knife like a guillotine (the tip of the blade comes into contact with the veg first). While chopping, keep your spare hand on the vegetables – holding them in place – with your fingers tucked under to avoid cuts. You’ve now got a big pile of beautifully chopped vegetables – what are you going to do with them? Raw vegetables contain more nutrients than cooked ones, and your young chefs may not have tried carrots or peppers in raw form yet. So get your group to whip up some fresh and delicious dips. Golden Korma: Beat ½ tub crème fraiche with 1-2tbsp of Korma Curry Paste. Sprinkle with 1tbsp toasted (or untoasted) desiccated coconut. Sticky Satay: Start with ½ cup of boiling water and carefully stir in 3tbsp of peanut butter, 1tsp of soy sauce, and 1tsp sugar. Sprinkle with chopped coriander. Nacho: Mix a jar of shop-bought tomato pasta sauce with some chopped parsley or chives. Spread it out in a shallow dish, and cover with grated cheddar and/or mozzarella. Grill for a few minutes until the cheese is melted, and then cool for a couple of minutes before dipping! Now that your group has chopped up plenty of vegetables, this is an assembly-recipe. Ask the younger children to prepare a pizza sauce, thickening a bought pasta sauce with tomato puree, or even cooking their own tomatoes with olive oil and sugar (they’ll stew quickly in a microwave) to a thick sauce. You’ll also need some grated cheese, which is a task that can be carried out under supervision by members of your group. To assemble, you’ll need fresh pizza bases (recipe below), which you can buy from a supermarket. Allow the children to build their own pizzas with chopped peppers and tomatoes, sweetcorn kernels, sliced mushrooms, and onion rings. You could also offer some interesting vegetables such as chargrilled artichokes; French-style peas; or marinated olives. When the pizzas are ready, bake in a hot oven for 15-20 minutes. Sieve the flour into a bowl, and stir in the salt, sugar and yeast. Make a well in the middle and add the olive oil. A little at a time, pour in 240ml of warm water, mixing at the same time, until the dough comes together. (You may not need all of the water.) Knead the dough for five minutes, then cover it with a clean tea towel and leave in a warm place to rise (about an hour). Knock it back, divide into four, and roll out your pizza bases. Introduce your group to sweet, smooth carrot juice – finely chopped vegetables cooked in a tomato sauce – or a creamy, cheesy potato and swede gratin. For a sweet vegetable treat, try courgette cake or pumpkin muffins!